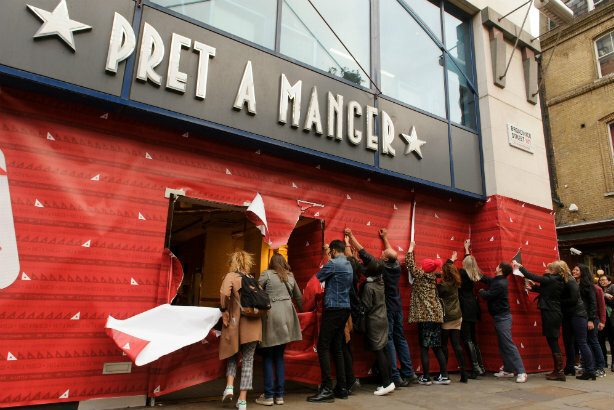 Café chain Pret A Manger has again taken a deliberately non-capitalist approach to its Christmas marketing campaign, which is designed to highlight its apprenticeship scheme for the homeless. The Opening Doors film, aimed at helping break the cycle of homelessness, follows three apprentices as they make their way through the scheme, from training to being offered employment. Filmed over eight months, the campaign was produced by Rumble and directed by Matthew Barton, who said: "Not only was I able to learn more about the extensive problem of homelessness in the UK, but I was also able to see how initiatives like Pret's could combat the issue successfully. I hope this film allows individuals and companies to look again at this growing issue and see how this positive impact could be multiplied." Pret is promoting the film online and across its social-media channels, sticking with its ethos of not producing a 'sumptuous' TV advert at Christmas, said the company's CEO Clive Schlee in a blog post this morning (15 November). The campaign is supported by customer contributions made throughout the year, including 10p from every soup sold and 50p from each of its Christmas sandwiches. "With your help we are hoping to raise just over £1.7m for the relief of homelessness this year," Schlee said. Last year's campaign, which included the decision to 'donate' its marketing budget to a group of charities, launched at a gift-wrapped shop (below) in London's Broadwick Street.